President Nana Addo Dankwa Akufo-Addo has commended Goldstar Air, a privately owned Ghanaian airline, on how far it had reached in its efforts to operate air services. “Let me take this opportunity on behalf of President Nana Addo Dankwa Akufo- Addo to congratulate Goldstar Airline for how far the airline has come in its quest to operate air services to and from Ghana,” Aviation Minister Cecilia Abena Dapaah, said at the inauguration of a new head office building of the airline, at Ashalley Botwe, Accra. Mr Ellis Hugh-Tamakloe, Chief Planning Officer of the Ministry of Aviation, read the Aviation Minister’s speech. The airline last December acquired the Air Carrier License, and processes to acquire the Air Operators License (ACL) have gone very far. It has also completed training for its cabin attendants, and intends to provide Ghanaian dishes on board with the intention of establishing a Maintenance Repair and Overhaul (MRO) Centre to help maintain aircraft both in Ghana, the sub-region and beyond. “I must say that this fits perfectly into our aviation development agenda and collaboration with the private sector. “It therefore comes as no surprise that as part of its preparations, the airline has put up this structure we are all currently viewing and about to open to enable them conduct their operations professionally,” Madam Dapaah said. She indentified aviation as a “catalyst for the socio-economic development for many countries, and a sector that contributed immensely to employment generation and wealth creation. “It is in the light of the above that H E… Akufo Addo sees the Aviation Sector as a key in the NPP Government’s agenda for change and hence established a complete Ministry to focus on the strategic development of the sector,” the Minister said. Madam Dapaah assured operators in the aviation industry that the Government would support and encourage local airlines and entrepreneurs to set up strong private airlines that could fully utilise all of the nation’s route rights, most of which were dormant thereby giving a “form of operational monopoly for foreign carriers on those routes. “The Government is also poised to establish a national airline with private sector participation to support our policy of making KIA an aviation hub in the region,” Madam Dapaah assured. The Aviation Minister urged the airline to speed up processes to see “aircraft in the skies” and take off existing best practices in the sector. Mr Eric Bannerman, the Chief Executive Officer (CEO) of Goldstar Air announced that the company would be operating scheduled and non-scheduled flights from Accra to 11 destinations, namely London, Dubai, Guangzhou, Lagos, Monrovia, Dakar, Banjul, Conakry, Freetown, Abidjan, Baltimore and Washington. He said the airline had made adequate preparations for takeoff during 2017 summer and would rely mainly on Ghanaians, meaning that it would create about 5,000 direct and indirect jobs when the airline commences its operations fully. Nii Amasa Asuku II, the Chief of Mamprobi and Head of Nii Tetteh Gbeshi Family in Accra, who chaired the inauguration, praised the location of the office, explaining it would allow the airline to monitor flights in the air. Mr Bannerman, together with Madam Christiana Quartey, and other dignitaries joined hands in cutting the sod to inaugurate the building. Ghanaian airliner Goldstar Air as part of efforts to indigenize its operations and rely on Ghanaians to man the aircrafts has successfully ended a two day cabin crew recruitment exercise in Accra. Out of over four thousand Ghanaian professionals who applied for the jobs, two hundred applicants were shortlisted in the first Phase of the exercise and are yet to meet management on Thursaday October 6, at Airside hotel for further assessment. According to authorities, the names of the new recruits are being sent to the Ghana civil aviation authority for training and later moved to the company’s hub in the Caribbean to begin operations. In a press release copied to GhanaWeb, the Chief Executive of Goldstar Air Eric Bannerman, said the focus of the company is to promote and protect the interest of Ghanaians, in view of this, Goldstar Air will roll out special services tailored to the needs of the aviation and tourism sectors. He however added “the selected applicants will be the face of the airline, they will also be selling Ghanaian culture, interacting with passengers in the local languages and making announcements in the local languages. Some of the Ghanaian local languages which will be the first of its kind on a commercial flight will be Ewe, Fante, Ga, Akan and hausa”. “Other new things to be introduced by Goldstar Air is the local food, local drinks, Ghanaian movies and documentaries on Ghana´s tourist sites in all our aircrafts flying in and out of Accra,¨ he said. This he said will showcase and promote the rich Ghanaian culture. He also mentioned that his company is working closely with some Hotels and Guest houses to have exclusive packages for organizations and institutions such as Churches, Student bodies in Europe, America and the Caribbean on visit to Ghana. On his side, the Director of Communications at Goldstar Air Theophilus Eze, said when the airline gets off the ground it will rely on expatriates as the cockpit crew but will unfold a tailor-made course of study to be undertaken by some Ghanaians who would be sent abroad to train as pilots in order to have a handle on piloting the Boeing series which Goldstar Air will be using. After the training, the company´s pilots will do a period of apprenticeship with the expatriate colleagues to get hands on experience and knowledge in line with the Goldstar Air plans of replacing foreign pilots with Ghanaians. ”The crew will be based at main hub which will be Accra and the three others which will be Europe, Caribbean and North America hubs. Our European hub will be Stansted airport which will service flights going to Accra and the Caribbean, making some pick ups in some European cities before its destination in the Caribbean. Our hub in the Caribbean will service flights to Baltimore and Stansted. whiles the Accra hub services West Africa, Dubai and Guangzhou, Baltimore hub will as well service flights to Accra and the Caribbean. This will see our Ghanaian cabin crew interchanging and working within cities in the West Africa, Caribbean, North America and Europe”. According to Theophilus Eze, some of the cabin crew recruits are former Ghanaian beauty pageant. “Pageants who have been among the top four of their respective pageants, notably the Miss Tourism, Ghana’s Most Beautiful Pageant show and others. Our brand ambassador Akweley who is the head of the cabin crew represented the Greater Accra region during the Ghana’s Most Beautiful Pageant show,” he said. The brand ambassador Akweley also noted that, as a lead representative of the airline, her role will be, to have an oversight of the Ghanaian cabin crew and also market the country to the array of passengers by throwing more lights on the rich cultural heritage of mother Ghana when the aircraft finally takes the ground. It appears that there is no end in sight to Seasons Travel and Tours, a subsidiary of Goldstar Air charter’s hunt for success in the aviation and tourism sectors. The company last Friday grabbed a silver award at the tourism category for its continued unwavering contributions to the sector. 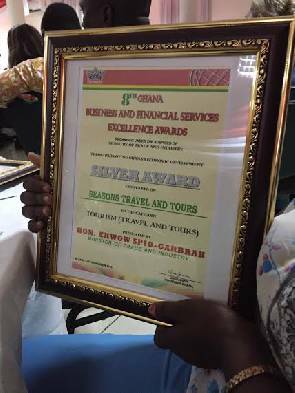 Seasons Travel and Tours received the international award at the just ended 8th Ghana Business and Financial Services Excellence Awards held at the plush Coconut Grove Regency Hotel, in Accra. The awards, put together by the Ministry of Trade and Industry was under the theme ”Promoting Ghana’s Economic Development”. The award came in the wake of recent success stories Goldstar Airlines operators of seasons travel and tours international has vowed to go a notch higher, according to the energetic and inspiring chief executive, Eric Bannerman. According to him this award underlined the hard work put in by the team of Goldstar Airlines. ”This recognition has come to spur us and the entire staff to work harder to reach the apex of success in the aviation and tourism sectors, Mr Bannerman said. The awards ceremony had in attendance, the Minister for Trade and Industry, Dr Ekow Spio Garbrah as guest of honour, Dr. Seth Adjei Baah, president of the Ghana Chamber of Mines and Commerce and Professor Sylvester Achio, rector of Accra Polytechnic as chairman for the occasion. The traditional ruler of the La stool, Nii Dr. Kpobi Tettey-Tsuru and some leaders in busines.